Lesley and I went back to the Sky Village almost exactly a year after our first visit. Our aim was to finalise the arrangements for our first house, to look at other houses that are available to rent and to try out a few more of the local attractions. We had a successful and enjoyable trip and are pleased to report that the Sky Village is in great shape. 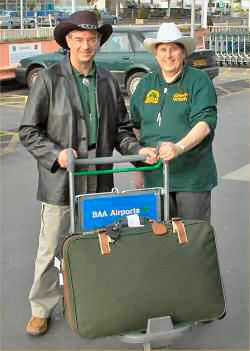 We took the same BA flight to Phoenix as last time, leaving Heathrow in the early afternoon as snow followed us across the country. We made good our escape in bright sunshine and headed west. The flight was comfortable and took us over the wastes of Northern Canada where the snow-covered mountains and plains are spectacular, even from 36,000 feet. On arrival in Phoenix we quickly cleared immigration and customs then picked up a hire car and drove to the nearby Days Inn where we had dinner at Spinners Diner, followed by an early night. At bedtime we received texts from home telling us about the snow that arrived just after we left. The next morning we had breakfast at Spinners then met Gene Turner, Development Manager for the Sky Village, who took us to the Cavco factory in Phoenix to see houses under construction. Glenda was our guide at Cavco and she showed us all stages of manufacture, starting with the trailer on which the houses are built and which becomes an integral part of the house structure. We were impressed by the speed and organisation of the work force, and the quality of the finished product. 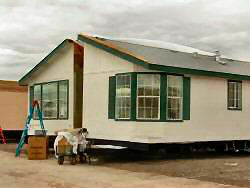 We felt confident that we had made the right choice in selecting a Cavco house. In the afternoon we visited American Home in Tucson, a massive furniture showroom where we were able to see many examples of American South-west furniture. Lesley may have enjoyed this part of the trip more than I did as I wasn’t born to shop. While looking round we met Janet who is helping with the house and interior design, along with Roy and Elise Furman whose house at the Sky Village had just been completed. They were on their way to view it for the first time so set off for Portal straight after the shopping. 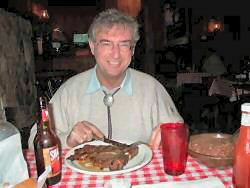 Gene, Janet, Lesley and I went to El Charro, an excellent Mexican restaurant, for dinner. That night we stayed in the Econo Lodge close to Interstate Highway 10 (I10) for a quick getaway the next morning. When morning came we decided we had plenty of time for the Jacuzzi and a swim, even though it was a bit nippy. 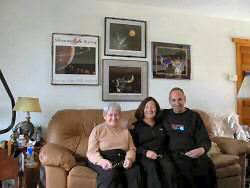 After a breakfast of coffee and doughnuts we drove to David Levy’s home at Vail on the outskirts of Tucson. It is only five minutes from I10 so didn’t take us far out of our way. 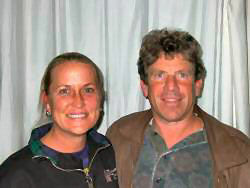 David and his wife Wendee were preparing for a star party for 35 teachers which they were hosting. Their house had been converted into a classroom for the day and everything looked to be in good shape. They also had Carolyn Shoemaker staying so it was a real privilege to meet her as well. She is charming and was very willing to pose for photos with us. David showed us round the Jarnac Observatory, as he calls the impressive array of telescopes in his back garden. Besides his telescopes there is a 24” Ritchey-Chretien Telescope on site. This belongs to a Canadian who operates it remotely over the internet. After leaving David, Wendee and Carolyn we stopped at Benson on I10 for lunch (and the inevitable bit of shopping) before continuing to Portal. When we arrived at the Sky Village the party was already going strong at Jack Newton’s house. He and Alice had invited lots of people, including owners and local people involved in construction and providing services. We met many delightful individuals including Mark Rich and his family. Mark has done quite a bit of the site construction and is a local rancher. Gene had arranged for him to take us horse-riding the next day. We stayed the night at Portal Peak Lodge, a popular place with bird-watchers, which is a couple of minutes drive from the Sky Village. After breakfast the next day we drove with Gene and Janet to the north end of the Chiricahua Mountains to meet Mark, his wife Deanna and six horses. 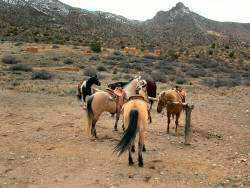 Mark brought the horses by trailer from his home in Animas, New Mexico and soon had them unloaded and ready to go. Lesley’s horse was called Mrs Dash and mine was Rebel Destiny, not names designed to comfort the novice rider but the horses turned out to be well-mannered and extremely sure-footed. Our ride soon left the dirt road and took us along tracks and trails that were used by early settlers on the way to California. The scenery was stunning as we made our way up to the ruins of Fort Bowie and we could imagine what it must have been like for those early pioneers. The ground is rough and the tracks unprepared, and a track-side graveyard was a stark reminder of the dangers they faced. This is Apache territory and the scene of some of the most desperate clashes between settlers and Indians competing for scarce surface water and hunting. At Fort Bowie we had a welcome break to stretch our legs and see the visitor centre. The exhibit I found most interesting was photos of bears, mountain lions and bobcats at a nearby cattle trough. Apparently these animals are still around and have even been seen in Tucson. In the evening we looked at the International Space Station Amateur Telescope installation in Jack’s old dome. It is a 14” Celestron SCT tube assembly on an Astrophysics 1200 mount and is being used for development work and testing. 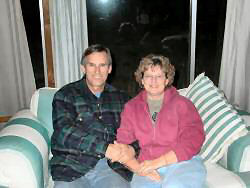 Afterwards we enjoyed a chilli dinner with Gene, Janet, Gene’s Mom and the Furmans. One of the great things about the Sky Village is how friendly everyone is and how strong the sense of community is becoming. The next day we planned a joint trip to Bisbee, a mining town close to Mexico which has become a tourist attraction with lots of Victorian houses nestling in the foothills. A flat tyre on our hire car held us up and after having it repaired in Animas it was too late to carry out our plan. 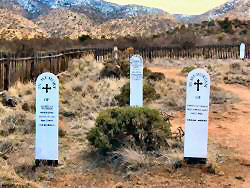 Instead, Lesley and I went via Bisbee to Tombstone to sample the attractions there and visit Boot Hill. 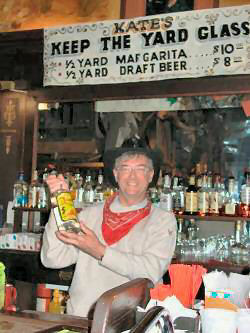 We were too late for a gunfight but consoled ourselves with drinks at Big Nose Kate’s saloon and even more shopping. We carried on to Willcox for dinner at the Desert Rose where we had eaten on our last visit. This took us all the way around the Chiricahuas giving us the opportunity to see what varied terrain there is to the east and west of them. We returned after dark to Portal via Foothills Road which is mostly unsealed. We hoped to see some wildlife but only managed a couple of Jack Rabbits. Apparently the best way to see animals at night is to have a pond close to the house. 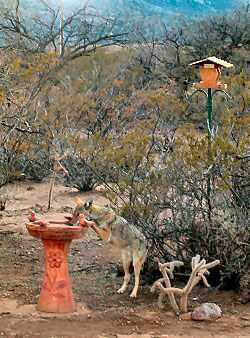 Even Coyotes and Javelinas (collared peccaries) will come to drink. The next day we went to visit a house just outside the Sky Village to see examples of different floors, then visited our first two plots with Rick and Vicky Beno. They have sold their house in Florida and plan to move into the Sky Village where they will be neighbours of Green Witch. The rest of the day was spent in design discussions with Janet followed by dinner for 13 at Portal Peak Lodge, real home cooking and great company, a great way to spend our last evening. Wednesday morning saw us leave the Sky Village after saying goodbye to everyone except Gene. He accompanied us to Willcox to introduce us to his attorney, Calvin Allred and to the local bank. Calvin is an interesting character and he told us about the cattle auctions held every week in Willcox and his camping holidays by horse-drawn wagon in the Chiricahuas. It looked as though the bank was going to take a while to process our applications for accounts so Gene suggested we visit the National Monument. This is an outstanding area of beautiful rock formations high in the mountains. 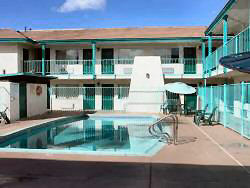 It is surrounded by a national park with campsites and endless trails for hiking. 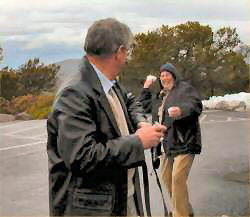 There was snow on the ground when we arrived there and after admiring the breathtaking views we had a short snowball fight. Some people never grow up. On returning to Willcox we found the bank closed (some things are the same the world over) so headed for Tucson where we took photos of the arrays of aircraft in Davis Monthan ‘boneyard’ before a well-earned steak at Pinnacle Peak in Trail Dust Town. 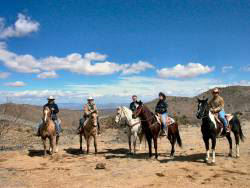 This is a real fun destination in Tucson and can be enjoyed by the whole family. We spent the night in the same Econo Lodge and took advantage of the Jacuzzi again before breakfast. It was raining at the time so we didn’t swim in the outdoor pool. 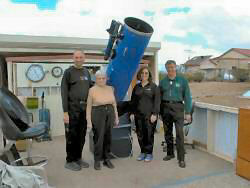 On our way out of Tucson we had arranged to visit Starizona, the local astronomy shop, where we met Donna and Scott. We had hoped to meet Dean as well but he had to go to Phoenix that day. 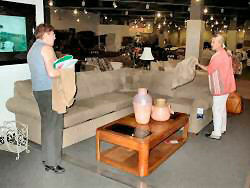 They have a great shop and offer public viewing four nights a week. In Arizona it’s worth arranging that kind of thing as the weather is so reliable. We’ve often contemplated something similar at Green Witch but feel we’d spend a lot of time waiting for cloud to clear. On our way back to Phoenix we stopped for a late lunch in the township of Chandler then returned the hire car and checked in at Phoenix Sky Harbour. As we waited for our plane a couple of delays due to bad weather were announced, then we were told there was a technical problem due to the weather and the engineers were working on it. After about an hour the plane’s captain came to the gate and gave a very full explanation of how the plane had been struck by lightning as it came in to land. This wasn’t unusual but it did mean that all the plane’s electronic systems had to be checked. Hence the delay. Our departure was delayed about two hours but we made some of this time up on the flight which was again comfortable and uneventful. The only problem was that I missed my appointment with Cheryl, the hairdresser, so I’m still in need of a haircut. Our overall conclusion at the end of the trip is that the Sky Village is beating all our expectations and is going to be a superb place to do astronomy. 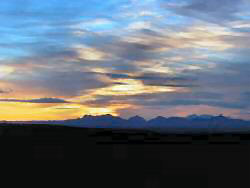 Not only that, the Arizona experience it offers will make a holiday there worthwhile, even without the astronomy. Provided you are prepared to leave your armchair and get out and about there is lots to see and do. It isn’t Disneyland, it’s real, so as Gene says, ‘Arizona is not for everyone’, but it does offer the holiday of a lifetime.